Yemen, already the most impoverished country in the Middle East, remains staring into the abyss of a humanitarian catastrophe as the brutal war waged by a reactionary coalition, headed by Saudi Arabia and backed by the United States and other imperialist powers, not only continues but intensifies. After a cynical five-day ceasefire, ostensibly for ‘humanitarian’ reasons, the Saudi-led coalition resumed its brutal blitzkrieg on Sunday 17 May. The Saudis, along with their allies and masters, claim that their bombing campaign, as well as their blockade by land and sea, is designed solely to halt the advance of the Houthi-led patriotic forces and their allies. Yet weeks of savage aggression have failed to inflict a single substantial defeat on the resistance fighters, whereas even friends of the Saudis have found themselves forced to whisper their disquiet at the terrible toll being inflicted by clearly indiscriminate bombing of civilian populations, health and education facilities and other infrastructure. 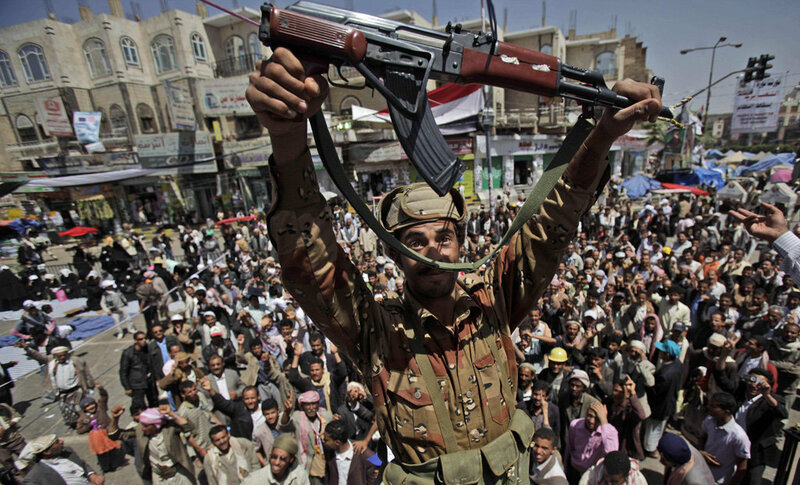 The stated goal of the Saudi-led war is not only to push back the Houthi-led forces, who, especially since they allied themselves to the forces of the long-serving former president Ali Abdullah Saleh, have taken control of much of the country, but also to reinstate to the presidency their own puppet, Abd Rabbuh Monsour Hadi, who fled the country for the Saudi capital Riyadh in March. 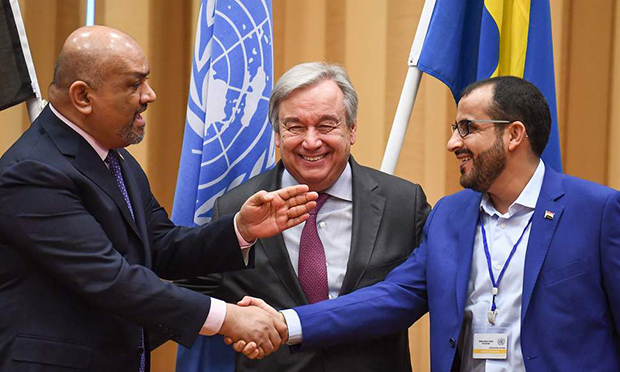 An appeal by the United Nations envoy to Yemen, Ismail Ould Cheikh Ahmed, that the five-day ‘humanitarian truce’ should be converted into a permanent ceasefire predictably fell on deaf ears. Saudi Arabia rejected outright any extension of the truce that might allow for the shipment and disbursement of much-needed aid to the suffering civilian population. Following the end of the ceasefire, there were at least three air strikes reported on Monday 18 May in the northern province of Saada, a stronghold of the Houthi forces. Bombs were also dropped on the southern port city of Aden, where the Houthis and allied forces control the presidential palace and have been fighting for control of the airport and other key areas of the city. Aden’s health chief al-Khader Laswar reported on 17 May that four people had been killed and 39 others wounded in fighting, including four women and two children. According to Laswar, 517 civilians and pro-Houthi fighters have been killed in the city since fighting began there in March. Saudi Arabia also resumed firing artillery shells and rockets across its southern border into northern Yemen. 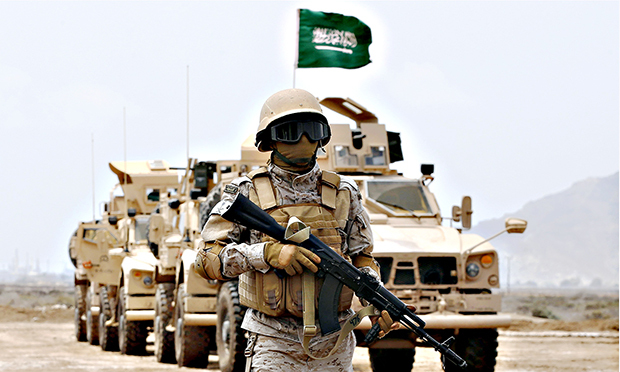 On 18 May, the Saudi military claimed that their forces had responded to mortars fired from Yemen at a military garrison in its southern Najran province. US Secretary of State John Kerry, who has repeatedly praised the bloodthirsty Saudi-led war of aggression in Yemen, including when he met with King Salman in Riyadh earlier in May, blamed the Houthis for the resumption of air strikes. “We know that the Houthis were engaged in moving some missile-launching capacity to the border and, under the rules of engagement, it was always understood that if there were proactive moves by one side or another, then that would be in violation of the ceasefire arrangement,” he told reporters on 18 May. 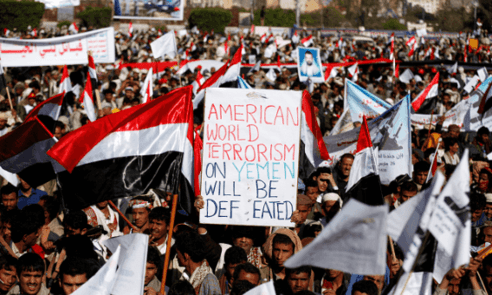 The Obama administration has consistently backed the assault on Yemen, since even before its inception, as part of its efforts to maintain control of the country, which occupies a key geostrategic position along critical oil transport and global trade routes. Yemen has also functioned as a base for US drones in the region. 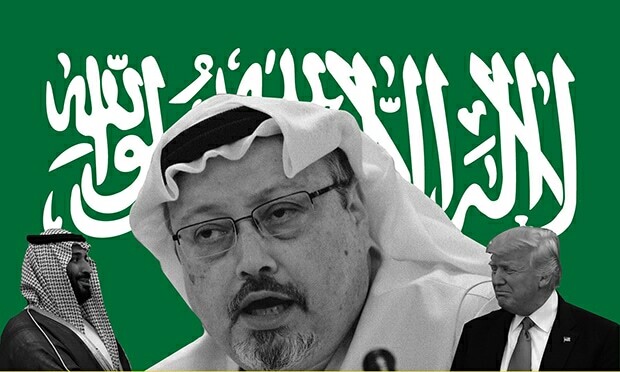 With consummate hypocrisy – seeing as both Saudi Arabia and the United States have consistently refused all the repeated calls for negotiations and peace talks aimed at bringing an end to the conflict advanced both by the Houthi-led forces as well as their Iranian allies – Saudi foreign minister Adel al-Jubeir released a statement in which he expressed “regret that the truce did not achieve its humanitarian goals”, and echoed Kerry’s fatuous claim that the Houthis were at fault for continuing their struggle. Reyad Yassin Abdulla, foreign minister in Yemen’s current Saudi-dominated puppet government, also placed blame on the Houthis for the failure to extend the halt in air strikes. “That’s what we said before – that if they start again, we will start again,” he told Reuters. Abdulla told reporters that the resumed air campaign would avoid facilities necessary for the receipt of humanitarian aid. “They will keep places for aid to come. They will keep places safe like Sanaa airport, Hodeida seaport, Aden seaport. We will encourage and support any humanitarian aid to come in,” he said. In fact, the Saudi-led coalition has repeatedly carried out air strikes on the civilian airstrips in Sanaa and Hodeida as part of its efforts to enforce a no-fly zone since it began military operations in March. It has also enforced a punishing blockade of the country’s ports, which, taken together with the no-fly zone, has cut off Yemen’s normal supply of food, fuel and medical supplies. As a result, as many as 20 million people, approximately 80 percent of the population, are now going hungry. “The Iranian Red Crescent Society, like all organisations affiliated [with] the International Red Cross/Red Crescent Society in Geneva, follows seven guiding principles of work. Among them are non-involvement in military operations, non-partisan delivery of aid and volunteerism. “The Iranians would welcome the United Nations or the International Red Cross/Red Crescent to inspect this ship. But the criminal Saudi regime and its US and Israeli allies are simply not welcome aboard. The Iranian government has made that absolutely clear, and all of us in the delegation of peace activists from Germany, France and the United States absolutely agree with this decision. In earlier atrocities, the Saudi forces have dropped bombs on residential neighbourhoods, a dairy factory in Hodeida, a refugee camp in northern Yemen and a warehouse containing materials for distributing clean water. The Saudi regime has admitted to targeting hospitals and schools, in brazen violation of international law, because it claims, with impeccably Hitlerite logic, that these are being used by the Houthis to store weapons and stage attacks. More than 30 schools have been wrecked by air strikes, while the fighting has kept more than two million children from attending class. The brief and cynical ceasefire has done nothing to ease the increasingly desperate conditions confronting millions of civilians in this desperately poor country. Civilians have borne the brunt of the assault, accounting for more than half of those killed and wounded. The UN estimates that in less than two months at least 1,820 people have been killed and 7,330 wounded in air strikes and fighting on the ground. Additionally, this Saudi-fronted imperialist war has already displaced more than half a million people. 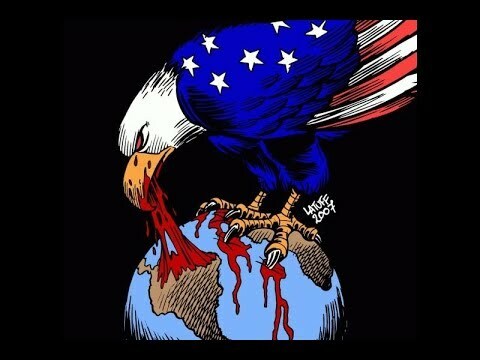 Whilst US imperialism has fully backed this murderous war, important contradictions are festering not far beneath the surface. Shortly before the farcical ceasefire, US President Barack Obama played host to a collection of emirs, crown princes and senior ministers of the Persian Gulf Arab oil monarchies – a collection of petty tyrants, thieves and royal parasites, who, along with the Israeli zionists, constitute US imperialism’s principal state allies in the region. Appearing before the press with representatives of the six regimes that make up the Saudi-dominated Gulf Cooperation Council (GCC), Obama described them as among Washington’s “closest partners” and affirmed a US commitment to “stand by our GCC partners against external attack”. In reality, the summit at Camp David was part of an increasingly tricky balancing act by the Obama administration as it seeks to conclude an agreement with Iran on its nuclear programme. This policy is bitterly opposed by the sectarian sunni monarchies, which view Iran as a threat – not least, in the cases of Saudi Arabia and Bahrain, in large measure due to their vicious repression of their own increasingly restive shia populations. The presence of only two of the six crowned heads that rule the GCC, the emirs of Kuwait and Qatar, was widely seen as a deliberate snub of the Obama administration by the oil monarchies, expressing their hostility to the negotiations with Iran and concern that US imperialism could yet hang them out to dry after decades of loyal service as the bastions of reaction in the Arab world. A number of the Gulf rulers may also have chosen to stay away after the Obama administration failed to follow through on apparent promises made earlier by Kerry to raise their level of alliance to the same level as that provided to Japan, south Korea and the members of Nato in the form of mutual defence pacts. The most notable absentee was Saudi Arabia’s King Salman, who assumed the throne just last January. But as he is widely reported to suffer from both Alzheimer’s and dementia, it is unclear as to whether the discussions were deprived of a great deal by his absence. For his part, Bahrain’s King Hamad skipped the summit for what he evidently considered a better offer – he chose instead to join Queen Elizabeth for a horse show at Windsor Castle. But despite such contradictions, gestures and tantrums, the US imperialists and the Gulf monarchists remain fundamentally united in their counter-revolutionary alliance, quite aware that they either hang together or they will be hanged separately.